Kleefeld Evangelical Mennonite Church began services and formally organized in 1874. The first building was occupied in 1939 with a subsequent building program in 1980. Peter Baerg is considered the founding leader of the group. The congregation originated through immigration from Russia. The language of worship is English; transition from German occurred in the 1970s. "Historical Flashback." unpublished typescript, 6 pp. Mennonite Historical Society of Canada collection, Mennonite Archives of Ontario. Mennonite Reporter (5 January 1981): 10. Archival Records kept at the church. Address: Box 129, Kleefeld, MB R0A 0V0; located SE 32-6-5e. By David P. Reimer Copied by permission of Herald Press, Harrisonburg, Virginia, from Mennonite Encyclopedia, Vol. 3, p. 194. All rights reserved. Reimer, David P. and Marlene Epp. "Kleefeld Evangelical Mennonite Church (Kleefeld, Manitoba, Canada)." Global Anabaptist Mennonite Encyclopedia Online. March 2012. Web. 23 Apr 2019. http://gameo.org/index.php?title=Kleefeld_Evangelical_Mennonite_Church_(Kleefeld,_Manitoba,_Canada)&oldid=156121. Reimer, David P. and Marlene Epp. (March 2012). 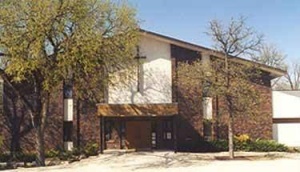 Kleefeld Evangelical Mennonite Church (Kleefeld, Manitoba, Canada). Global Anabaptist Mennonite Encyclopedia Online. Retrieved 23 April 2019, from http://gameo.org/index.php?title=Kleefeld_Evangelical_Mennonite_Church_(Kleefeld,_Manitoba,_Canada)&oldid=156121. This page was last modified on 12 December 2017, at 15:31.